I promise I'll start posting more than links. Until then, here are some interesting ones. Rainbow compression wave from a jet caught on film. A syllabus from one of the late David Foster Wallace's Pomona College classes. Lighting up the brain to illuminate its secrets. Are disposals green? Related - this site shows water consumption and drought conditions all over the country, in case you were wondering. Order this kit and you can have your DNA lineage mapped. And here, you can have a DNA portrait made. Continue reading "Tuesday morning links - 9/30/08"! Below is a video of James Watson and E.O. Wilson being interviewed by Charlie Rose. They discuss the influence of Charles Darwin on biology. Watson is a wanker, but his contribution to science is great, so I can listen to his perspective on that. Continue reading "Science on Charlie Rose"! The semester has started. I'm (more) busy again. Tuesday is my one day without any scheduled obligations, so I'll take the opportunity to pass along some Internet fodder. WATER BEARS FROM OUTER SPACE! NASA chief Mike Griffin laments Bush administration dissin' his space missions. Stem cells for the troops. Harvard biologists get closer to building synthetic life. Ten things you didn't know about the Earth. The science of religion (via Nick). UK former chief scientist Sir David King calls on "brilliant minds" to tackle climate crisis. Thai prime minister ousted after appearing on cooking show, receiving money. Continue reading "Tuesday morning links - 9/8/08"! Spore, the latest game from Sims/SimCity creator Will Wright, comes out this Friday. The Creature Creator for the game has been out for a couple months, and over three million creatures have been created (one of mine is here). Today's NY Times science section has an article about the game that nicely summarizes Will Wright's creative intention - to make a fun game loosely based on evolutionary principles - while correctly pointing out some of the scientific caveats. Wright spent a lot of time talking with scientists to really understand how the diversity of life arises from simple systems. It looks like a lot of fun, I'm happy it will be available for my Mac. The article points out another interesting video-game like application of evolutionary principles, this one much more useful for research. Scientists often use computer simulations to model population dynamics - how large groups of a species interact, mate, survive, and spread their genes. 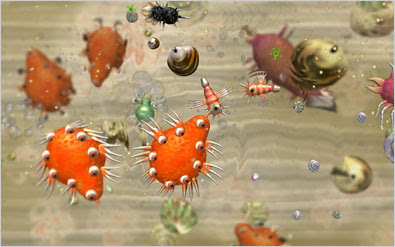 Avida is a software program developed by researchers at Caltech and Michigan State that imposes a digital version of natural selection (the mechanism of evolution) on a collection computer programs designed to behave like simple organisms. Each little program has it's own virtual CPU and isolated memory, allowing it to run at different speeds. The programs can mate, mutate, replicate, compete for digital resources and, over time, evolve into slightly new programs, with slightly different code (analogous to mutations and changes in DNA that correspond to the evolution of real organisms). The simulations are totally computer based, so it's possible to examine evolution at extremely large time scales. This offers great insight into how simple organisms behave and evolve over time, and it allows scientists to test real-life events (such as mass extinctions, the introduction of new species, etc) that would normally only play out over millions of years. They can also test various mating and survival strategies and a whole slew of other interesting questions. This article entitled "Digital Evolution" offers a lot more information about simulating evolution in a computer, and one of this group's original scientific papers can be found here. Thinking more about this, how much research is going to be conducted as a simulation in 50 years? There are limitations now, of course, we are nowhere near adequate simulation of complex organisms - that still requires grunt work out in meatspace - but if one day you could build a computer and run software over the weekend to collect data instead of observing some natural phenomenon for several years, that's going to be a game-changer. Continue reading "Spore and artificial life"!